The cross has been a symbol in Christian churches since at least the second century. But given the theological importance the evangelists often ascribe to the cross, one would expect to see it earlier and more often in Christian art. But in fact, we see only disguised hints of it in the early church. And we never find literal depictions of the crucifixion until well into the middle ages. One reason for this is the persecution of Christianity until the fourth century. But evangelical author Philip Yancey suggested another reason; that the cross did not fully take form in Christian churches until anyone who had ever witnessed an actual crucifixion had died. I think Yancey's observation is an astute one. There is something in our human nature—and especially in American culture—that shrinks from the thought of death. Of torture and execution, doubly so. But for centuries the Church has embraced this symbol of execution, because, as Paul states, "to us who are being saved it is the power of God." How foolish this must seem to the world! Imagine a church in which a corpse dangles from a hangman's noose or sits limply in an electric chair, and you will perhaps understand how strange it must seem for Christians to embrace the crucifix. In American Lutheran churches of the past half century or more, there seems to have arisen the misconception that the crucifix with corpus is a Catholic fixture, whereas the empty cross is a Lutheran/Protestant one. In addition, it is commonly explained that the empty cross signifies the resurrection, whereas the crucifix somehow fails to acknowledge (or lessens the significance of) Christ's rising. But it should first be observed that Lutheran churches have prominently displayed crucifixes from the Reformation to the present. The crucifix has never been viewed by believers as a denial of the resurrection, nor has the empty cross ever carried any special signification of it, until recent decades. 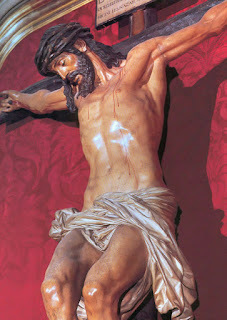 To the Church, the crucifix has only ever been a symbol of God's tremendous love made manifest. In Christian freedom, we of course have the option of displaying our faith in Jesus in many different forms. Neither a corpus nor an empty cross is wrong or harmful—both may be equally worshipful. But when we make choices about artwork in our churches, they should at least be made from an informed perspective. It appears that the crucifix is falling out of use in our churches—but the worst of it is that no one really knows why. If the myth that the crucifix is a particularly Catholic fixture continues, along with the belief that everything "Catholic" should be avoided, this valuable symbol of our faith may fall entirely out of use among Lutherans. We have no need to fear that a lack of crucifixes will cause the gospel not to be preached. But I do see a potential danger. Children have difficulty with the abstract concepts that adults are fluent in. Children learn primarily by observing. Where may children observe Jesus? I grew up in churches that displayed only empty crosses. In fact, there were no depictions of Jesus anywhere. If it had not been for the illustrated Bible story books my parents read to me, and the great care they took in teaching me about my Savior, I don't know for certain if I could have maintained faith in an abstract notion of God. I am by no means trying to discredit the Holy Spirit for his work. But if Jesus taught with pictures, why should not the church? How great a teaching tool would it be to have a crucifix in the front of our churches? Then our children would know that we do not worship an abstract god, but a God who was made flesh and blood, as we are. He entered into human history, was born of a woman, ate food and drink, made friends and enemies, suffered and died on a cross, and rose from the dead. He is not the transcendent god of Modernism or the impersonal god of dualism. He is our brother, our friend, and our Savior.